It's a testament to how massive a music act is when there are huge hits in their back catalogue that can become forgotten. Artists like Madonna, Elton John, Michael Jackson and Kylie Minogue who have hit the top 10 so often that some of those singles have now been somewhat swept under the carpet. 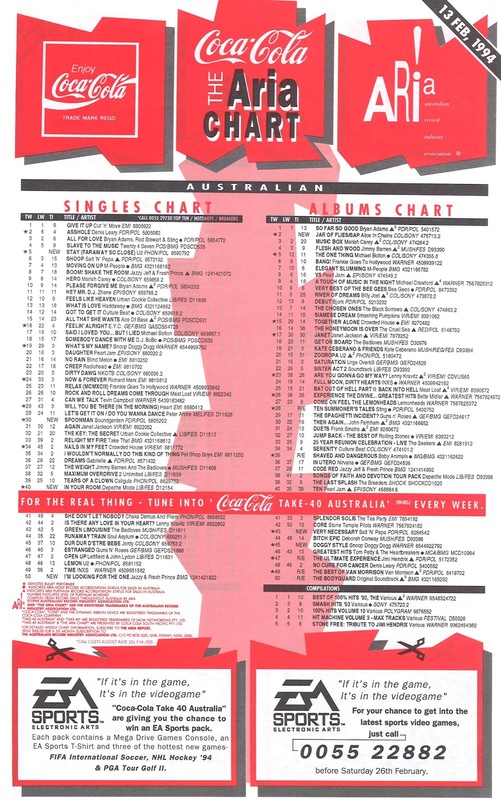 This week in 1994, a new double A-sided release by the biggest band in the world at the time crashed straight into the ARIA top 5, but it's definitely not a title I would've come up with on my own if asked to name their best chart performers. The best chart performer this week in 1994 was Cut 'n' Move's "Give It Up", which held off a charge by Denis Leary to hold down the number 1 spot for a second week. A month after "Into Your Arms" reached the top 50, another jangly single from Come On Feel The Lemonheads made a brief visit to the lower end of the top 100. One week after the enduring "I'm So Into You" fell out of the top 100 and the same week that "Right Here (Human Nature)" left the top 50, this former US chart-topper, which had been released between those two tracks in America, had a much smaller impact locally. Also proving less popular was this follow-up to "All That She Wants", which remained in the top 15 in its 23rd week on the top 50. The Swedish four-some weren't quite done yet, though. The FGHT re-release project continued with their fourth top 50 from 1985 hit dusted off for another go at the chart, but it fell some way short of its original peak and the position climbed by the remixed "Relax". Using the Peter Andre/Jeremy Jordan approach to launching his music career - a new jack swing/pop track, shots of his body - the teen heartthrob star of TV's Blossom didn't repeat his US and UK top 20 success in Australia. They'd strike gold with a soundtrack single later in 1994, but for now American band Urge Overkill could content themselves with a first chart foray with this single from fourth album Saturation. This four-track EP consisted of songs taken from the Nickelodeon animated characters' debut album You Eediot!, and never bettered this debut position. With which normal programming was restored. Number 1 hit "Boom! Shake The Room", which was still inside the top 10 this week, would prove to be the only charting single from the hip-hop duo not to peak in the 40s or 50s, with this S.O.S. Band-sampling follow-up becoming their fifth track to peak in that region. This would be the final time we'd see the pair on the chart... although rapper Will Smith would soon make himself quite at home higher up the top 50. After two singles peaking in the 70s, I was a little surprised to see one of my favourite bands of all time back in the top 50 with this fourth track lifted from Songs Of Faith And Devotion. But two things worked in its favour - 1) "In Your Room" was radically changed from the album version thanks to new production from Nirvana's Butch Vig and 2) Depeche Mode were about to embark on their first ever national tour of Australia in March, having only ever played one show in Sydney in 1990. I actually lined up overnight for tickets to their 1994 Sydney show, such was my devotion (sorry!) to the band. As it did in other parts of the world, this lead single from fourth album Superunknown took the grunge band into the mainstream. "Spoonman" had been included in an early acoustic version in the film Singles back in 1992, but was remodelled by the band for this later release. The song was inspired by street performer Artis the Spoonman, who, as the name suggests, plays music using spoons. 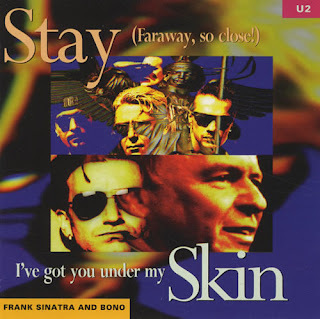 Here's the U2 top 5 I'd completely forgotten about until now - a double A-side release containing the final single lifted from Zooropa and the remake of "I've Got You Under My Skin" by Frank Sinatra and Bono taken from the former's 1993 Duets album. A second version of the single, with different bonus tracks and without the duet, was also available. After tracks like "Numb" and "Lemon", "Stay (Faraway, So Close!)" was more classic U2 - a rock ballad that actually started out with the working title "Sinatra" and was inspired by the Chairman Of The Board. An alternate version of the song also appeared in the film Faraway So Close, thus its subtitle. The Cole Porter-penned "I've Got You Under My Skin", meanwhile, was a song Frank has recorded a number of times, but not one he nor any other artist, including The Four Seasons and Neneh Cherry, had ever taken into the top 50 before. 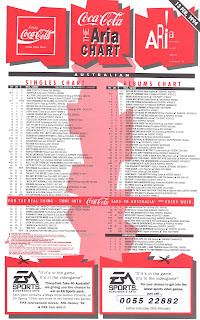 This would be Frank's final singles chart apprearance in Australia. Next week: 1994's other verson of "The Power Of Love" arrived on the chart, as did one of the biggest boy band hits of all time. Stay (Faraway, So Close!) is probably my favourite U2 single, I loved it then and still do now - but can definitely see why it would have been a forgotten hit. American top 40 was another casualty to Pillow Talk in Melbourne, bumped to starting at 1am or thereabouts, on a Sunday night (so not at a listenable time, for a school student, anyway). Subsequently, there were many big US hits that didn't 'break' locally, like 'Weak', that I missed at the time. It's funny how a song called 'Happy Nation' sounds so melancholic. I like it though. There is a '94 (or '93, whichever it was) remix video for 'Welcome To the Plesuredome', consisting of footage from all of their earlier videos, but given the other is on an official channel, it would probably be blocked if I were to upload it. I assume 'Happy Happy Joy Joy' was the main 'song' from the Ren & Stimpy EP. At least, it was the one I heard at the time. 'In Your Room' denting the top 40 surprised me too, but no doubt the imminent tour helped. It's one of their better singles, I think. Without checking whether I was on the right track or not, I had assumed 'Spoonman' was a song about a heroin addict. 'Stay (Faraway, So Close)' definitely is forgettable. When I compiled a video compilation of top 10 singles from the 90s that missed the end of year top 100 charts, U2 had quite a few entries. By this point, it was as though they were largely a die-hard fans-only act, though with a big enough fan-base to regularly debut in the top 10 (and then drop). Interesting how U2s stay (Faraway, so close) didn't finish in the yearly top 100, despite it debuting at 5 & remaining there for 3-4 weeks. I like it, much more than the abysmal Numb. Lemon was decent & a change of sound for them.